Results: Yes! That's the answer scientists from OI Analytical and Pacific Northwest National Laboratory got from their experiments to see if the new IonCCDTM can detect negative ions and large ions. Furthermore, employing instruments at EMSL, the team used the detector to characterize the ion beam inside a mass spectrometer, a workhorse instrument for basic energy research. 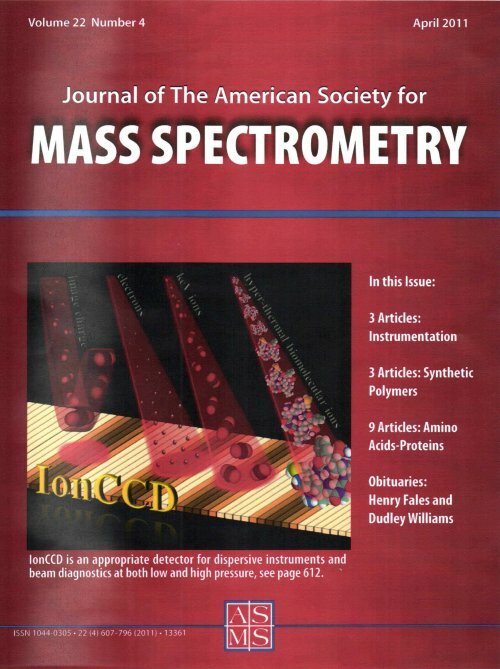 The results grace the cover of the Journal of the American Society for Mass Spectrometry. Why it matters: While most scientists think of mass spectrometers as analytical tools that enable characterization of proteins, pollutants and other molecules, mass spectrometers may also be used to create materials. For example, researchers are using the instruments to prepare novel catalysts that increase the efficiency of chemical reactions (see related articles). To build tailored materials, these special mass spectrometers deposit layers of specific ions onto a surface. With the IonCCD's ability to directly visualize the ion beam, scientists can produce beams of ions with narrow diameters, and thus design instruments that more precisely create materials. 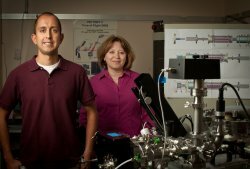 "We were excited," said Dr. Julia Laskin, who led the research at PNNL. "With the IonCCD, you can visualize ion beams, whether they are at atmospheric pressure or high vacuum." Methods: To test the IonCCD, the team began with a mass-selected ion deposition instrument, built by Laskin and her team at EMSL, a national scientific user facility. The team placed the IonCCD inside the deposition instrument that produces beams of ions. The IonCCD, using a pixel-based detector array, accumulates the charge of the ions on its surface. The charge is then dumped onto a waiting electronic system, where it is detected. When negative ions were sent to the IonCCD, it correctly measured them. When large ions, positive or negative, were fed through the detector, it again gave the desired response. In addition to the detection work, the team also explored visualizing ion beams inside the ion deposition instrument. This work was the subject of a second publication in the Journal of the American Society for Mass Spectrometry. Scientists usually rely on phosphor screen detectors to visualize ion beams. These detectors only work under vacuum due to the high voltages they require. So, if the ion beam is at high gas pressure the phosphor screen detectors don't work. Further, conventional detectors are bulky and, therefore, often provide a limited view of the ion beam because of the spatial confinements of a vacuum chamber. With the small-sized IonCCD detector, scientists can see what ions are in the beam and how they are moving throughout an entire mass spectrometer system. Such information may be used to improve the design and construction of these instruments. What's next: The researchers are determining if the IonCCD can detect charged droplets in the ion beam. Droplets in the early stages of an electrospray mass spectrometer cause signal to drop and provide poor results. Acknowledgments: This work was supported by the Office of Basic Energy Sciences, Chemical Sciences, Geosciences, and Biosciences Division, of the U.S. Department of Energy. The research was done in EMSL, a national scientific user facility at PNNL. The research was done by Grant Johnson and Julia Laskin of PNNL and Omar Hadjar, Gottfried Kibelka, Scott Shill, Ken Kuhn, Chad Cameron, and Scott Kassan of OI Analytical. Johnson GE, O Hadjar, and J Laskin. 2011. 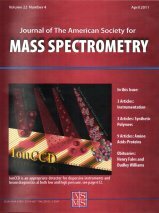 "Characterization of the Ion Beam Focusing in a Mass Spectrometer Using an IonCCDTM Detector" Journal of the American Society of Mass Spectrometry. DOI: 10.1007/s13361-011-0154-4.